General Anyone have recent experience installing DMC seat covers? [General] Anyone have recent experience installing DMC seat covers? Thread: Anyone have recent experience installing DMC seat covers? Anyone have recent experience installing DMC seat covers? I just received a set of seat covers from DMCH this weekend and am in the middle of installing them myself and adding some heating pads while I'm at it. I followed the "Slip Me Some Skin" article (I realize there have been some changes to the design since this was published) as well as several threads on here to get this far, but I'm stumped on how these are supposed to be secured below the headrest. The articles I've read seem to imply there are (or were) two ribs below the headrest that can be zip-tied to the seat, which pull in the 'neck'. However, as you can see below these covers don't have ribs, nor do they have any kind of sleeve to re-use the old ribs. 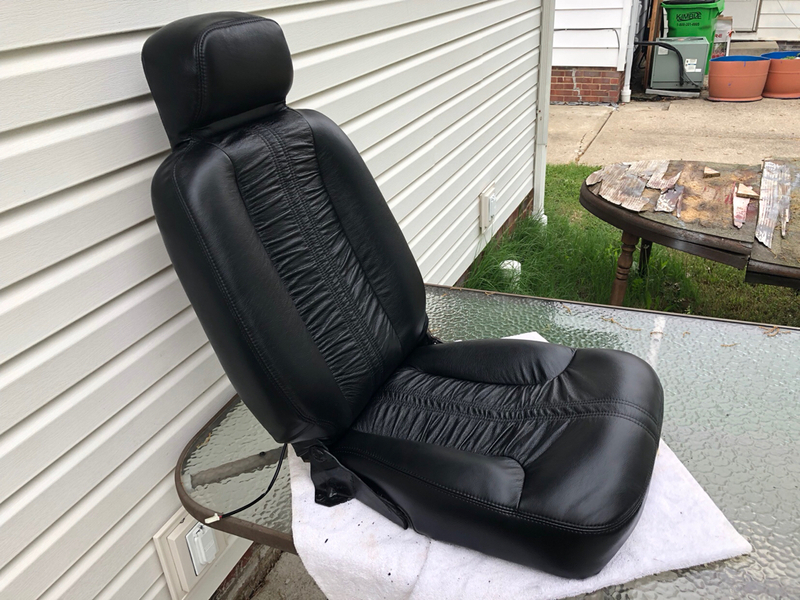 The seat covers I'm replacing were custom so I'm not sure what the originals looked like, but there was one metal rod in the neck that I can reuse. I cut a small hole in the backing fabric of the new seats and put that rod between the fabric and the foam to pull the neck in, but I want to make sure I'm not missing something. It looks okay-ish, and may improve once I start stretching and securing the back with hog rings, but I want to be sure I've got it right before that step. I find it difficult to believe the neck shouldn't be pulled in at all, so am I missing something or is it possible this was a manufacturing oversight? Basically, you don't need to reuse the wire ribs. There are integrated plastic ribs that you zip tie around. You'll want to do the upper headrest rib first, then the lower one. Have a look, and please ask if you have any more questions. Recovering the seats is a fair amount of work and when you are done, your hands will be sore from all the stretching and pulling, but it is very rewarding. Last edited by DMC-81; 05-13-2018 at 02:44 AM. Thanks - yours is one of the write-ups I reviewed, but if you look at the picture in my first post there are no integrated ribs or sleeves in the neck on the covers I'm installing. So my real question is whether I'm missing something or if the manufacturer changed the design to intentionally omit these ribs. Everything else seems to be exactly as described in everyone's recent writeups. Edit - Just realized it may not be super clear in my picture, but there are no ribs there, just the foam and insides of the seams. Oh, sorry I missed that. Yes, there should be 2 ribs in the neck area. I would definitely call DMC tomorrow to see if the design changed or if there was a manufacturer oversight. Problem solved - after some investigation the vendor noted the neck-ribs were inadvertently left off of some seat covers. I've shipped them back to be corrected and in the meantime I'm actually kind of enjoying the extra cargo space where the passenger seat used to be. I finished mine with heaters added using the covers from DMCMW I have the retainers in the area before the headrest. Much easier to install than remove. I have found that over time with some use, some of the wrinkling effect smoothes out, so the effect doesn't look so stark as when you first put them on. They look much like the level of this effect in the original 1980's interior pictures. I am very happy with these seat covers... I think they got them right. Where did you source the heaters from? Seems like most heater pads all come from the same couple of vendors in HK. You can find them on Amazon, eBay, in a million different configurations. If you just want a basic set of low/high/off switches there are lots of those, too. The controls that came with the above kit look OK but are cheap feeling. The driver circuit design is decent. At 14v, each pad when cold draws about 2.7A, so budget power accordingly. I finished mine with heaters added using the covers from DMCMW. I have the retainers in the area before the headrest. Much easier to install than remove. Looks great! I just got an e-mail today that my covers have been fixed and should be back to me by Saturday. In the meantime I'm sanding and painting the seat rails, and trying various rust stain removal methods on the carpet where the rails were. Carpet cleaner, hot water and elbow grease mostly worked, but tomorrow I'm going to try vinegar/lemon juice/salt and see if that takes care of the rest. Of course all that scrubbing also removed 35 years of dirt and revealed what appears to be the original color - still gray, but much less dingy. Now I'm afraid I won't be able to live with myself if I don't scrub down the entire interior.